This is a review of a book that is not for the young, but certainly for the young at heart. 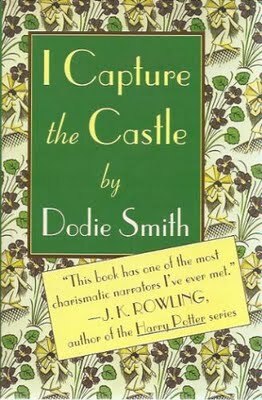 I Capture the Castle, published in 1943 by Dodie Smith (her first novel), begins with all the trappings of a fairy tale, but uses them to tell a story so real that there’s nothing fairy-tale or cliché about it. The first major action mirrors the beginning of Pride and Prejudice: the neighboring manor, empty since the owner’s death, is at last re-inhabited by his two handsome grandsons: dashing young Americans who are terribly interesting and perfectly single. However, the remaining 90% of the book has absolutely nothing to do with Pride and Prejudice, and both Cassandra and Rose find out what misery is caused by trying to force life to match fairy tales. On the way, Cassandra’s views on wealth, history, God, romance, travel, and people are stretched even as she writes down these experiences and her reflections in her journal. The primary delight of this book is in Cassandra’s witty and wise narrative voice. If I’d read it at age seventeen (or younger), I think I would have found the vague and meandering plotline of the book uninteresting and the ending incomplete. I related to many of Cassandra’s stories, but in the middle of my teen years I wouldn’t have had have the distance to sift out the wisdom in them. But that’s because at the time I was looking for fairy tales, and this is a story about real life. In the six months Cassandra’s journals cover, we watch her grow up—from a starry-eyed child to an adult who perceives the world with a more complex awareness of both its joys and sorrows (fancy word for this genre: bildungsroman). She becomes a young woman who stands tall with maturity and self-respect, valuing her family, her integrity, and her dreams of authorship more than grubbing desperately for “happily ever after.” Anne of Green Gables would call her a “kindred spirit,” though she comes from the other side of the Atlantic. As Cassandra “captures” the castle and the people around her in words, we watch her become a “wise young judge,” a strong, funny, honest, real heroine who is ultimately very worthy of respect. This is a book for aspiring writers, for young women who have wrestled with singleness, for those who love England. It’s for adults who can identify Cassandra’s wisdom but still remember going through the difficulties of gaining it for themselves. It’s for people who enjoy a witty narrator describing her unconventional life in vignettes both down-to-earth and poetic. It’s not quite like any other book I’ve read, but I’ll be keeping this one. Have you read this book? Seen the movie adaptation? Does it remind you of something else? Add your thoughts to the conversation!